Like the rest of the world, Canada is facing new and urgent energy challenges. As our energy demand grows, so too does the need for additional infrastructure that can deliver reliable and sustainable electricity to Canadian consumers, drive demand management and employ conservation. The Canadian Energy Innovation Summit brought together our country’s leading energy thinkers and practitioners to participate in a national conversation exploring opportunities for global leadership in energy innovation. 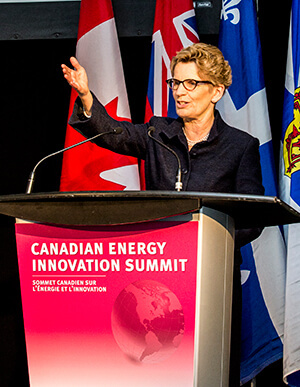 Ontario Premier Kathleen Wynne kicked off the summit with a passionate keynote address highlighting Ontario’s strong cleantech sector, which is already generating over $8 billion in annual revenue. She also highlighted the province’s strong pipeline of innovative companies, using MaRS clients Enbala Power Networks and Hydrogenics as examples. Premier Wynne emphasized the importance of MaRS and its role in creating an innovation ecosystem, bringing together public, private and not-for-profit organizations and creating opportunities for collaboration. She then announced the launch of the Advanced Energy Centre, which will be based at MaRS and will capitalize on domestic energy markets to demonstrate technologies and develop international market opportunities, extending Canada’s role as a clean technology leader. 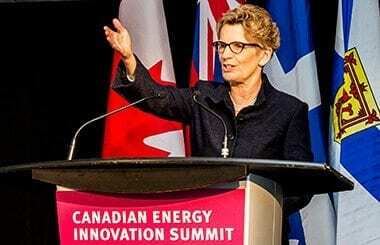 In Premier Wynne’s words, the Advanced Energy Centre will “showcase to the world the expertise that Ontario has to offer.” She then went on to thank Capgemini, Siemens and Hydro One for their leadership as “early adopters, having already signed up as founder partners” with the Advanced Energy Centre. Through four panels, the Canadian Energy Innovation Summit explored opportunities for environmentally responsible economic development and the vital role energy innovation will play. Several common themes emerged over the course of the day, including a need for collaboration, overlapping and related opportunities for the future, and the strength of our current cleantech sector. There is a strong need for greater communication, sharing of best practices and exploration of opportunities between governments and other stakeholders—including post-secondary institutions and the private sector—if we are to advance renewable energy and support Canada’s growing clean technology sector. 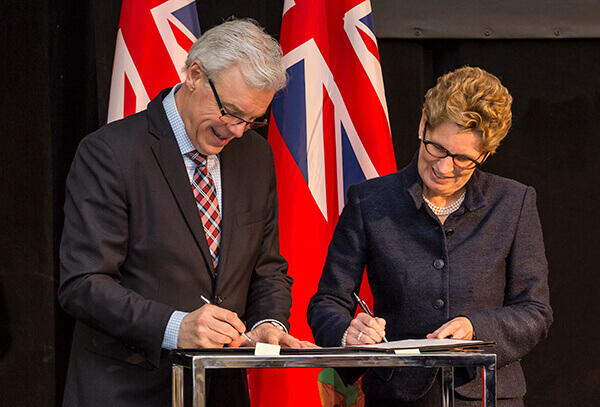 A very fitting example of such a partnership was formalized at the summit when Manitoba Premier Greg Selinger and Premier Wynne signed the first bilateral, interprovincial agreement identifying areas of collaboration to enhance economic development and energy innovation. Ali Haj-Fraj, general manager of Siemens Power Technologies International, began his talk by highlighting several of the main pain points currently affecting Canada’s electricity system, including geographical challenges, market pricing, distributed generation, grid capabilities, aging infrastructures and CO2 emissions. Throughout the day, speakers addressed these points, among others, from diverse perspectives and two major themes emerged. The first theme, as explained by Gordon Hicks, president of Brookfield Johnson Controls, was that “efficient technologies exist today, but their implementation is limited by an inability to articulate the business case.” Nicholas Parker, founding managing director of Global Acceleration Partners, expanded on this when he commented: “In export markets, you’ve got to sell solutions, not technology.” The consensus throughout the day was that export markets are going to be integral to Canadian cleantech innovation becoming a force in the global economy. In his keynote, Luis Alberto Moreno, president of Inter-American Development Bank, discussed how we quantify societal benefits in terms of avoided costs and economic benefits. In this light, results indicate that societal benefits are sufficiently large to compensate for the cost disadvantage of solar and wind energy against fossil alternatives, justifying the eventual wholesale entry of these options. Through Ontario’s Green Button initiative, and particularly with the recent Energy Apps for Ontario Challenge, we’re already seeing the power of both data and customer engagement in the Ontario energy ecosystem. It is no surprise that, with an already strong and globally recognized cleantech sector, Canada is doing some important things right when it comes innovation. In his talk, Tom Rand, senior advisor in MaRS’s cleantech practice, presented some success stories from MaRS entrepreneurs, illustrating the importance of government funding opportunities such as Sustainable Development Technology Canada, Innovation Demonstration Fund and Smart Grid Fund. MaRS CEO Ilse Treurnicht also welcomed audiences with her thoughts on the Canadian landscape. In his keynote address, Manitoba Premier Greg Selinger remarked that “Canada has some of the best research and development tax credits in the world.” Later in the day, Bruce Orloff emphasized the importance of the Ontario Green Button initiative and it’s role in both educating and engaging energy consumers. There were several recommendations made throughout the day that capture at a high level the future of energy innovation in Canada and summarize what we can (hopefully) expect to see going forward. Ali Haj-Fraj called for not only technical solutions, but also a paradigm shift to include the development of the business models and processes required to implement these solutions. He identified political support, regulatory framework and societal awareness as three important aspects of realizing this shift. Derrick Dalley, minster of natural resources for Newfoundland and Labrador, remarked that the “easiest thing we do is to find problems, but the real challenge is finding solutions.” He went on to say that collaboration, communication and partnership will be key. Elyse Allan, president and CEO of GE Canada, highlighted the need to move quickly in order for innovation to work. She explained that we need to come up with models of innovation that facilitate speed, that are tolerant of failure and that are patient and flexible. Murray Coolican, deputy minister of energy for Nova Scotia, raised the issue of the need for innovation in government in addition to the private sector to help make everything work. I look forward to seeing the conversations and partnerships that follow from the Canadian Energy Innovation Summit in the coming months, as well as the role that the Advanced Energy Centre will play in the Canadian energy innovation ecosystem.